Curated by Stephen Banham, Christine Eid and Andrew May. Presented by City Gallery in association with the State of Design Festival 2011. This exhibition explores rich stories of our city, our communications and us through letterhead design. The design of ephemeral material is often overlooked, and letterheads are one example – once used, they are often discarded. However, letterheads, designed to move from place to place and from person to person, actually trace the perpetual movement and development of city life. Over the nineteenth and twentieth centuries letterheads have exhibited an enormous range of style and content, both in development of aesthetic / design elements, and the commercial demands of propaganda. 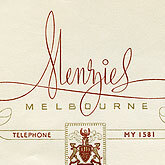 Each letterhead marks an important step in the development and progress of the City of Melbourne, and each correspondence reflects dynamic social change. The values and aspirations of the city are manifest in these little, thin pieces of paper. Together, they build a paper city. Paper City takes a closer look at different types of letterheads, their content, meanings and symbolism. In the 21st Century, where email might sounds the death knell of a letterhead as a traditional advertising form, it is appropriate to celebrate a century and a half of letterheads and logos which have constructed the paper city – the city of imagination, commerce and desire.